The perfect curtain call for an unforgettable series. Redemption, second chances, forgiveness and fate—Kristen Ashley explores these themes with Franka and Noc’s story. Rife with both beauty and pain, I relished every moment of their tangled, tumultuous journey. We’d met Franka Drakkar before and it was clear she was not liked at all, not by anyone. She’d put people in danger, and as a result had become even more detested by those around her. She’d lost a lover too, and even though in the end she’d saved them all, Franka was not a woman anyone wanted around. Then the darkness she’d been enduring, the truth she’d been hiding, it all came to light, revealing someone that no one knew existed. Noc Hawthorne had seen something more in her, but even he didn’t realize the depths, scars and pain with which she’d lived. Franka’s world seemed to change in a moment. She’d been freed from her past, unmasked by circumstance, left to live a life where others who’d shunned her now wanted to know her, help her, love her. But throwing out the mask she’d always worn was not an easy thing. Franka had grieved for her former lover, but as time passed, Noc had seen her—truly seen her—in a way no other had. His words, his insistence, had cut through to the heart and soul of her. 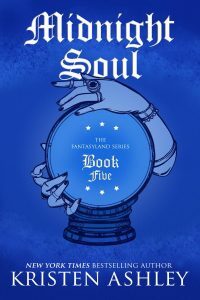 Together they embarked on an adventure that would unleash her magic, her true self, and open them both up to experience the kind of love fated between worlds. But just as we had learned with Franka, perception does not always equal truth, and Franka had much to learn about Noc. In addition, we also see Circe (of the fantastical world) reach for her own happiness, unshackling herself from her own dark past. I loved the message woven through Franka, Noc and Circe’s stories, that what we’ve endured, the mistakes we’ve made, the circumstances that surround us—don’t define us. There are second chances and people who are there to help us, guide us, love us. It’s a powerful message to feel and these pages radiated with the beauty of it. 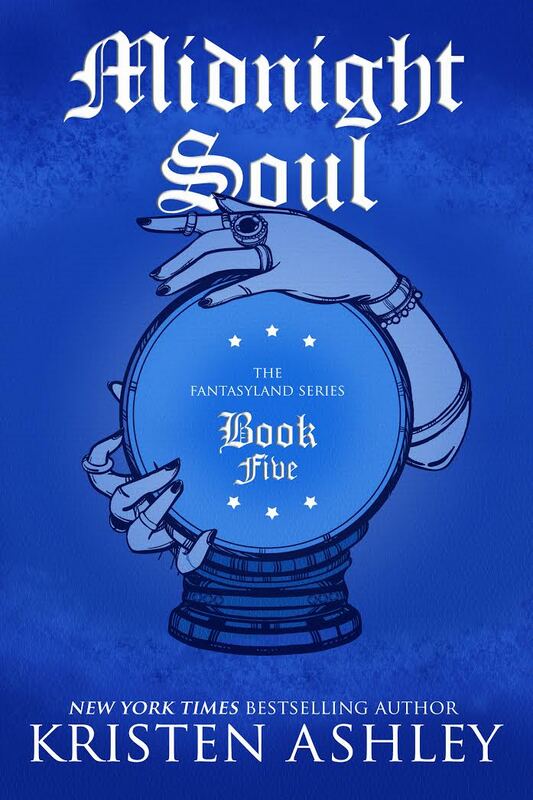 The Fantasyland series has been one of my top favorites in Kristen Ashley’s repertoire. Every story touts an amazing mix of romance, fantasy and adventure with of course, themes of family and friendship that make it KA through and through. Midnight Soul was a deeply heartfelt finale, a perfect curtain call for an unforgettable series. That day had been one I wished to quickly forget. Indeed, the months since those witches took my Antoine had been time I wished I had the power to erase from my memory. I did not have that kind of power. These thoughts on my mind, I moved down the hallway of the Winter Palace, seeking my room where I planned to pull the cord, ring a servant and request several bottles of Fleuridian wine. Wine might not make me forget, but I’d found of late that it served well to dull the pain. I turned the corner, my eyes to my slippers, but my senses made me lift my gaze to the passageway. At what I saw, I halted and grew still, then slowly and quietly retraced my steps and ducked behind the corner, peering back around. The Prince Noctorno of the other world was in the doorway to a bedchamber. Although, he was not actually a prince. Not in this universe. Apparently they had very few princes in that other world. A world that existed on a parallel plane where all beings had twins to my own world. This I thought was rather mad (everything about it, obviously), but with few princes, that meant there were few kings, so who ruled? He reported that he was instead a member of the city guard, an occupation he referred to as being “a cop.” A rather surprising statement considering all that was him. He was no member of a guard. And he called himself Noc, for some unknown reason, as Noctorno was a fine name, a strong name, a regal name (this last was true as his counterpart in this world was a prince). And right now he had has back to me. He was wearing a pair of trousers the like that couldn’t be found in my world. They were made of a rough, sturdy, faded-blue material. He also had a shirt that was not the fashion in this world. It was attractive and made of an equally attractive plaid. And it was a shirt that fit his broad shoulders magnificently. His thick, black hair was untidy (this also attractive). And I could see his light-blue eyes but only in my imagination as he had his back to me. They were not eyes you were likely to forget. With his dark hair and skin browned in the sun, those eyes were deliciously striking. There was a day, though now that day seemed lifetimes ago, when a sight such as Noctorno Hawthorne of another world (or indeed this one) would have caused me to have a much different reaction, not only to him, but to my plans for the imminent future. That was before I met the man who introduced me to, well…me.